One benefit of living in San Diego, or Tijuana Norte, is our proximity to great Mexican food. And it’s impossible to attend a few birthdays (Mexican or not) without eating the ubiquitous tres leches. Pastel de tres leches, or “three milk” cake, is usually a sponge cake drenched in 1. evaporated milk, 2. sweetened condensed milk and 3. heavy cream (or half and half). It’s moist and sweet and lighter than you would expect. Planning our Bebe’s first birthday party, I was content keeping the menu simple and having Whole Food’s catering make sandwiches. But I wanted to try my hand at making dessert. 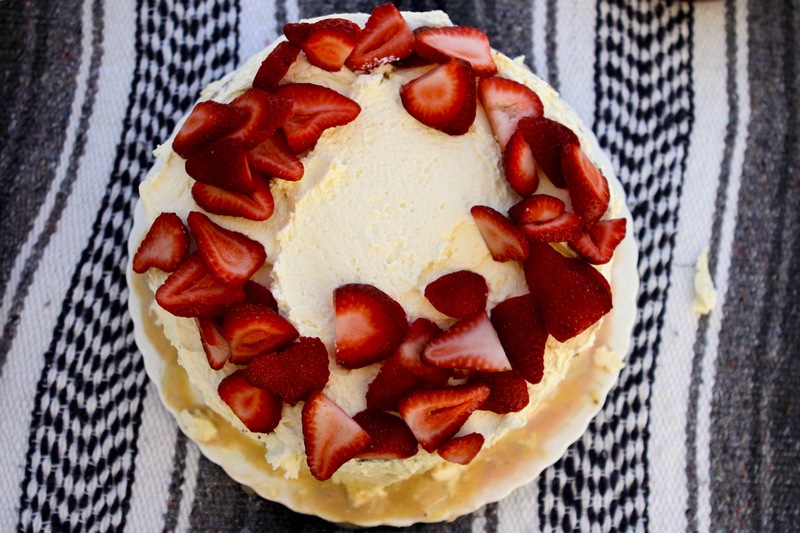 Since her party had a strawberry theme, I wanted something with strawberries, whip cream, and cajeta, of course. It may not be a beauty, but it turned out delicious! TO MAKE THE CAKE: Preheat the oven to 350°. Grease a 2-inch deep, 10-inch round cake pan or springform pan. Line the bottom with a round piece of parchment paper, then grease the paper and flour it all – pan and paper. In a small pan, melt the butter over medium heat, stirring and swirling until the butter is nut brown – about 5 minutes. Remove the pan from the heat, swirl to allow it to cool a little, then stir in the vanilla. Set aside until needed later. In the large bowl of an electric mixer (you will need a heatproof bowl, preferably stainless steel), combine the eggs, 3/4 cup of the sugar and the orange zest. Select a saucepan that the mixer bowl will fit snugly into without the bottom of the bowl touching the bottom of the pan. Add to the saucepan about 1 inch of water and bring to a simmer. Set the mixer bowl over the simmering water (you’ll need to regulate the heat so the water no more than simmers), and whisk for several minutes, until the mixture in the bowl is very warm to the touch and foamy, and the sugar is completely dissolved. Transfer the bowl to the electric mixer and beat the warm egg mixture for a full 5 minutes (the mixture will be as thick as whipped cream that almost holds peaks). Lower the speed, and now, with the mixer on the lowest speed, add the almond meal and flour a couple of spoonfuls at a time, letting one addition just disappear before adding the next. Thoroughly mix 1/4 cup of the cake batter into the butter/vanilla mixture. Then, in 2 additions, use a whisk to fold the butter mixture into the remaining cake batter. Immediately and gently scoop this batter mixture into the prepared pan and bake until the cake feels slightly springy on top and the sides just begin to pull away from the pan, about 35 minutes. Allow the cake to cool in the pan for 10 minutes, then turn it out onto a rack and cool completely. TO FROST THE CAKE: With an electric mixer on medium-high speed, beat the remaining 1 1/4 cups of the cream with the remaining 2 tablespoons of the sugar and the orange liqueur until very stiff. (I skipped the liqueur as I had a few friends at the party that do not drink alcohol.) Spread the whipped cream over the sides and top of the cake. Refrigerate until ready to serve. I topped it with fresh strawberries. The cake layer can be made several days in advance, wrapped in plastic and refrigerated; it may be wrapped and frozen for up to 3 months. The cake can be soaked a day ahead, but do not frost until the day you are serving. Do not attempt to make a double recipe in a standard size mixer. I learned the hard way that the sponge really grows!